Joe was the Camper of the Day a week ago on one of his last days at Home Run Baseball Camp over at Turtle Park. He really loves going to camp there. A lot of your friends and Jack's friends have gone, like Jake and the Stern boys. I was there last week when a cameraman from a local TV station came and videotaped all of the campers yelling "Good Morning Washington." The first person you see is Coach RJ. I have told you about him before. He teaches at Beauvior, where you went to camp. Joe is in the upper right hand part of the bleachers, but it is probably tough to see him. He loved camp. Camper of the Day is given for hustle and Joe has plenty. I am proud of him. He has a pure love for baseball. We are going to see the Nationals play the San Francisco Giants tomorrow night at RFK. I am interested to see what the guys do when Barry Bonds comes to the plate. Both Jack and Joe call him a cheater. I saw this post on someone else's blog this morning. They are photos of a little girl who has Fanconi anemia. You can tell by her eyes. She is beautiful and so is her little sister. It is nice for parents to have pictures like this. The photographer who did these is really good. She lives in Ohio, though. Otherwise, I think I would call her and see about getting shots of Jack and Joe. I miss you. I was thinking it is time to head out to the cemetery. It is a long weekend. Hopefully I'll make it. Love. Today is the first day of school for your brothers. Joe is starting kindergarten and his teacher is Mrs. Berliant. It is nice that Joe has the same teacher that you and Jack had. The last picture is of Jack. I had to take the picture from outside the door, 'cause class was starting. He began 5th grade today. He said "so long" to me and Mom and that was it. He (and you) was like that from his earliest days at the Gan. He didn't need us to hang around. He was ready to go. No "separation anxiety." I need to show you some pictures of our vacation at the beach and I have some shots from when Joe was "Camper of the Day" at Home Run Baseball Camp. Speaking of Joe, he had to have a root canal yesterday. That is something really painful that the dentist does when your tooth is messed up. You would have been proud of him. He was really brave, just like you. We went down to South Carolina for the weekend. That was pretty different for us. Aunt Jen, Uncle Dan, Hannah, Papa Teddy and Jeri were there. We stayed in a place called Folly Beach which is near Charleston. The house where we stayed was right on the beach. Joe is getting a bit more brave. Mom, Jack and I did a lot of body surfing. We are going to Rehoboth starting tomorrow for a full-blown family vacation. Something really terrible happened. The bridge that goes over the Mississippi River in Minneapolis fell down. It is the one right next to the hospital. We used to drive over it about twice a day going between the apartment and Fairview. All of the Fanconi families who are in Minneapolis for transplant are okay. 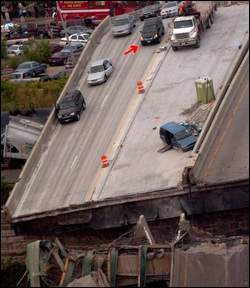 Dr. Wagner was on the bridge 15 minutes before it fell. And Stacy Stickney Ferguson was on it right when it collapsed. She is okay. Here is a story in the newspaper that tells what happened. Vehicles are stopped on a section of the Interstate 35W bridge on the east bank of the Mississippi River after sections of the bridge collapsed near downtown Minneapolis Wednesday. The arrow shows the vehicle being driven that day by former Cedar Rapids resident Stacy Stickney Ferguson. Stacy Stickney Ferguson, a 1978 Cedar Rapids Kennedy High School and 1982 Luther College graduate, said today she still was trying to return to normal life after being on the Interstate 35W bridge that collapsed in Minneapolis Wednesday evening. "This was a life-changing event for everyone that was touched by it," Ferguson, a daughter of Bill and Kathy Stickney of rural North Liberty, said by phone today. A photo showing Ferguson's van has appeared on the front pages of Thursday's and today's Gazette. It is next to a flatbed truck with a white cab, and aimed downward on a slab of highway. "I was in the lucky part. I wasn't further along (on the bridge) and so I'm grateful for that," she said. Ferguson, 47, was going home from work when the accident happened. She is with the National Marrow Donor Program, where she works with families seeking bone marrow transplants and several facilities that include University Hospitals in Iowa City. Ferguson moved to Minneapolis 15 years ago. She said her the Gazette phone interview she she was fortunate and feels for others in the crash who suffered. "The bridge began to rumble. And dust began to raise in front of me. At first I just thought it was the normal vibration as trucks had gone by. But within a matter of a second or two I began to see in front of me the rocking of vehicles. And my car was rocking back and forth. And because I wasn't going so fast I was able to at least think that I was going to stop. "And the roadway then began to decline and fall in front of me. And within just a second or two we were then still. But it was horrific, the magnitude of what had happened ahead of me -- vehicles continuing to go forward and careen down, a (road) worker careening down and other workers hollering for help. And at the same time the workers were yelling, 'The bridge is collapsing.' And yelling for the people to get off. "So the group that I was in proceeded to get out of our cars and walk away from the decline as the pavement was broke behind us. So then we crawled over the fence of the highway and we were able to walk away. ..
"Many cars are reported to be in the water. And many people have survived getting themselves back to the surface." Gazette: What did you see out your front window as you were aimed down? What were you seeing? Ferguson: "... You're driving along, life is good, the road is flat and then there's the sensation of moving downward. So what I saw was the rumbling and the dust rising and the roadway giving way and falling downward. The back end that I was attached to was still attached so I was not in involved in the section that free-fell down. It's kind of hard to describe." Gazette: Were you seeing just nothing at the end of that stretch of road or could you see the other stretch of broken road on the other side? Ferguson: "I couldn't see beyond just the edge of that broken road. I was up higher and everything else had fallen below. And, keep in mind, it's just a matter of seconds. We were then getting off the bridge and removing ourselves, you know, pulling ourselves away from the wreckage." Gazette: It would seem obvious that not seeing much after that road then would cause some fear for you? Is that a fair assessment? Ferguson: "I think everyone was afraid. There was a worry that there would be further collapse, even though we were still in those few moments we were moving ourselves off of the bridge. ... Then it was quiet, and then the sounds: the responders, the people in the crowd, people helping people around them. The first responders then came. We're near the university (University of Minnesota) so people came that were in the neighborhood to see what was happening and try and help those that were there." Gazette: How important was it to let your family know that you were OK? Ferguson: "Immediately, of course. ..."
Gazette: Have you been able to look back on this and put into perspective the narrow brush that you had with death, to just put into perspective? Ferguson: "I think that's part of the process in making meaning out of this turn of events. I feel that I was not near death. I was in a place where I did not have that immediate threat. I left the scene without a scratch. I feel that there were other people who were in a more precarious place than I was." Gazette: Do you think about those folks much? Ferguson: "Oh, yes. This was a life-changing event for everyone that was touched by it." 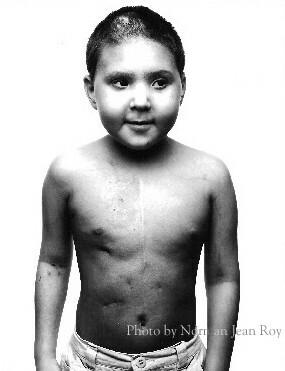 Help the Hope for Henry Foundation - Buy Saving Henry from Amazon Today! Henry's Garden Dedication June 2008 from Allen Goldberg on Vimeo.